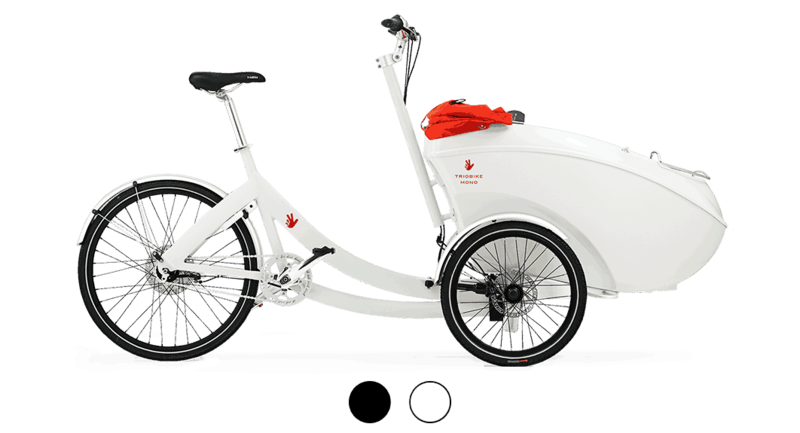 The Triobike mono is one of the world’s lightest three-wheeled cargo bikes. The aluminum frame and plastic pod weigh just 69.5 lbs. The pod is crafted in one seamless piece to be tough and safe and all materials are free from heavy metals and harmful chemicals. 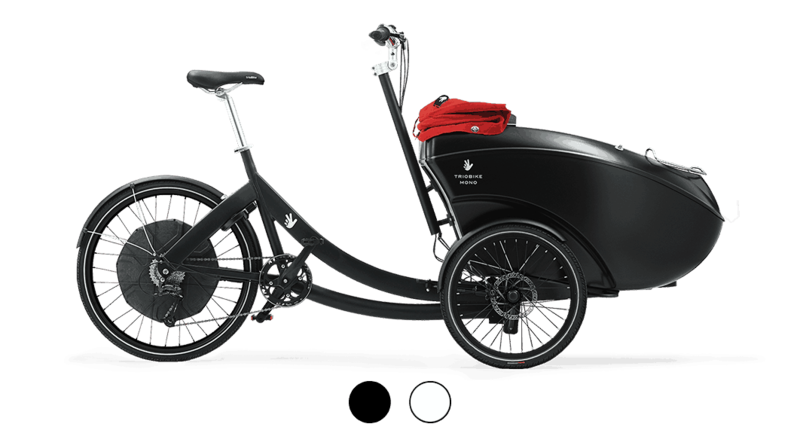 Create your perfect Triobike mono cargo bike with a color palette of up to 648 beautiful combinations and enjoy maintenance that’s as easy as a two-wheeled bike. Triobike mono is the safest, easiest and most stylish alternative to buying a car. There are few places safer than in the comfy seat of the Triobike mono box. We pioneered a unique molding technique to make this in one seamless piece that is extremely tough. The external skin, made from ABS vacuum-formed plastic with rounded edges, is durable and shock-resistant. And the shell is filled with PU foam, creating a strong, but light, ‘sandwich’ construction for maximum passenger protection. Our e–power electric motor system lets you flatten hills and travel up to 37 miles with the pod fully loaded. The powerful electric motor does all the work for you. The stylish display helps you keep track of the battery level, distance and speed and you can choose exactly how much help you want from the motor. All e-systems provided by Triobike comply with European EN 15194 standard. Add any number of useful accessories to your Triobike mono – from an army green seat to an ocean blue hood or practical puncture-free tires. Your kids’ safety and comfort are top of our list. The Triobike mono seat is ergonomically designed to be comfortable and free from harmful chemicals, PVC or heavy metals. Our carefully-selected materials also ensure that ice cream, ketchup, and chocolate are no match – it’s easy to wipe clean. The seat folds away to create space when needed. Plus, it looks great as it’s manufactured in the same furniture factory that makes Danish Designer Arne Jacobsen’s iconic ‘Swan’ and ‘Egg’ chairs. We’ve ensured that the Triobike mono hood will keep water out, will not catch fire and will never fade thanks to a special solution-dyed sunacryl acrylic fiber that is water resistant, fire tested and 100% UV stable. The hood has a window at the rear, so you can keep an eye on your kids as they enjoy the view (a double zipper also lets you easily open the back window). Every hood is hand-sewn by expert craftsmen.